With simple, three-button operation and sturdy plastic construction, the portable Dune compact balance is a smart choice for labs, schools, warehouses, offices, or veterinary facilities. Dune balances quickly deliver precision readings on a large display, so results are easy to read. A streamlined design makes the Dune lightweight and portable, so it is easy to transport from classrooms to the field. Automatic calibration is performed through the keypad, and the Dune provides indicators for overload and low battery. Dune balances are often used for mixing paints, varnishes, lubricants and coatings; offering a stable, chemical-resistant weighing pan that is easy to clean down after use. 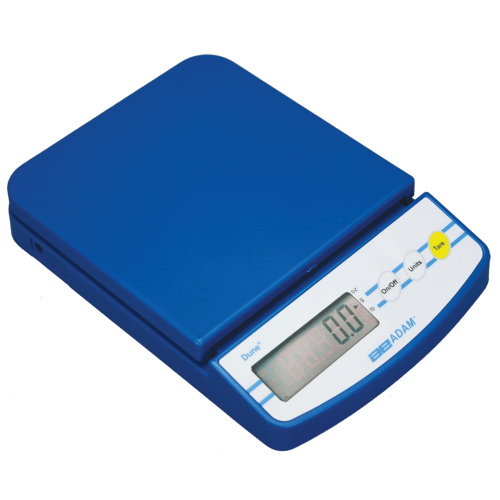 Dune compact balances are inexpensive weighing machines that are often used in school classroom weighing experiments due to their simplicity, easy operation and durable construction. The Dune is often used as a quick reference weighing tool by warehouse operatives and can be used to weigh post, products, food and manufacturing parts. The compact, lightweight design of the scale makes it easy to move this balance around between different workbenches and worktops. Vets can use the Dune for weighing small pets such as rodents, marsupials and reptiles.